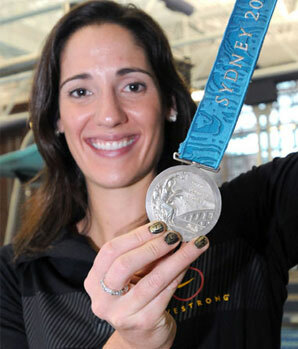 Kristina (“Kristy”) Ann Kowal (born on October 9, 1978 in Reading, Pennsylvania) won the silver medal in the 200-meter breaststroke at the 2000 Summer Olympics in Sydney. In addition, she is a two-time World Champion (1998) in the 100-Meter breaststroke and the 400 medley relay, and also won silver in the 200-meter breaststroke that same year. She has won multiple international swimming medals in addition to breaking eight American Records and one World record during her career. Kristy was the first American woman to win the World Championship title in the 100-meter breaststroke and also the first American woman to break the one-minute barrier in the 100-yard breaststroke. Kowal helped her college, the University of Georgia (UGA), to two NCAA Women’s Swimming and Diving Championships. She was the first woman in the Southeastern Conference history to win the 100 and 200-yard breaststroke titles four consecutive years. In 2000, she was named NCAA Woman of the Year and was recipient of the Today’s Top VIII Award as a member of the Class of 2001, which honors eight outstanding senior student-athletes each year nationwide. She was the NCAA Swimmer of the Year in 1999 and 2000 and won 10 United States National Titles and eight NCAA titles. She graduated from UGA in 2002 with a Bachelor of Science in Education (B.S.Ed). In 2004, she was named the team captain of the World Championship Team competing in Indianapolis. Kowal then retired from swimming after finishing her career on US soil. Kristy Kowal was recently inducted into the University of Georgia’s prestigious Circle of Honor and the Pennsylvania Aquatic Hall of Fame. She was a 1996 graduate of Wilson High School, located in West Lawn, PA. She is now an elementary teacher at Whitfield Elementary in the Wilson School district, (her alma-mater) in West Lawn, Pennsylvania.